Every successful company grows by making its customers happy. If you build a product people love, they’ll tell all of their friends and family about it. This sort of “word-of-mouth” growth is very powerful, but without a system to measure, track, and improve it, you can’t properly utilize it as a true growth strategy. How do you know which of your customers are actually satisfied enough to recommend you to others? If you knew this, you could know which places of your product and user experience to improve to increase the number of people who recommend you. Enter the Net Promoter Score (NPS). What is the Net Promote Score? The Net Promoter System is an easy way to gain insight into your business based on your customers’ feedback. With just one question you can measure the performance of your brand. Then you can react on hard data, not just a hunch. The Net Promoter Score is calculated from responses to the simple question: "How likely are you to recommend us to your friends and colleagues?” on a scale of 0 to 10. Users who respond with a score of 9 or 10 are called Promoters. You’ll want to make sure you support these users as much as possible, and understand exactly what makes them love your product. Users who respond with a score of 0 to 6 are labeled Detractors. You’ll want to make sure you understand exactly what went wrong for these users. The Net Promoter Score is calculated by subtracting the percentage of customers who are Detractors from the percentage of customers who are Promoters. The Net Promoter System was developed in 2003 and was used mainly by large companies. Now with more affordable online tools even smaller businesses and entrepreneurs can start taking advantage of it. NPS follows the pace of your business. It tells you how well you are doing according to your customers. And because the survey is repeated every couple of months, you also know the trend of their satisfaction. Since last year, are you doing better or worse? And if you are doing worse, how do you learn what happened? Ultimately, NPS is just a number representing your customers’ satisfaction. So when collecting NPS, it’s useful to also ask for open-ended feedback. When you see the start of a negative trend, you can look into the NPS tool to find out what dissatisfied customers wrote. Then you can use this information to improve your product, improve your support, change your positioning to better meet expectations, or find a better product–market fit. When you gain such insight into what your customers think, you can easily send personally customized messages. You can use these messages as an ice-breaker, reduce churn by helping Detractors before they leave you, get more word-of-mouth recommendations, persuade trial users to sign up for a paid version, and so much more. The key is to always follow up after getting a response—this shows your users that you listen to them and act on their responses. Do you want to give NPS a try? Luckily for you, there’s a tool called SatisMeter which is up to the task. 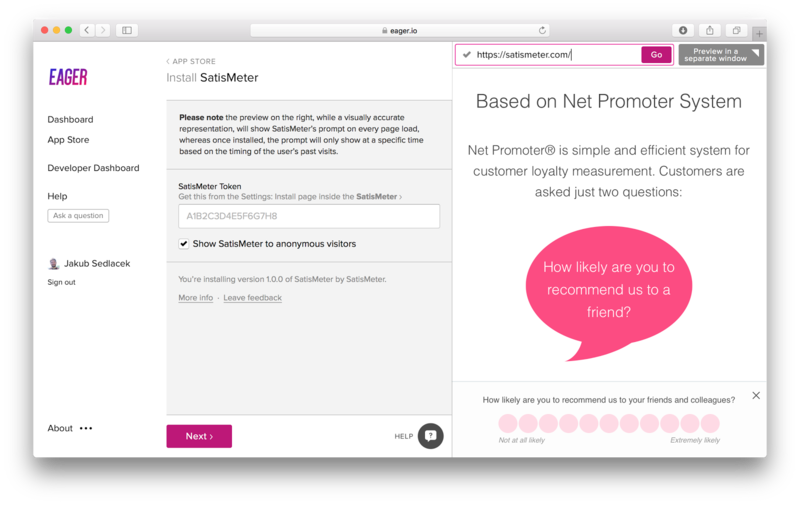 SatisMeter enables you to gather NPS and customer feedback inside your web app/website with a simple pop-up. You can see NPS trend, filter verbal feedback and follow up on users’ responses directly inside the SatisMeter Dashboard. SatisMeter also integrates with other services, so for example you can send the feedback immediately to a Slack channel, add gathered responses to the corresponding customer in Intercom or use webhooks to send it to hundreds of other analytics tools. 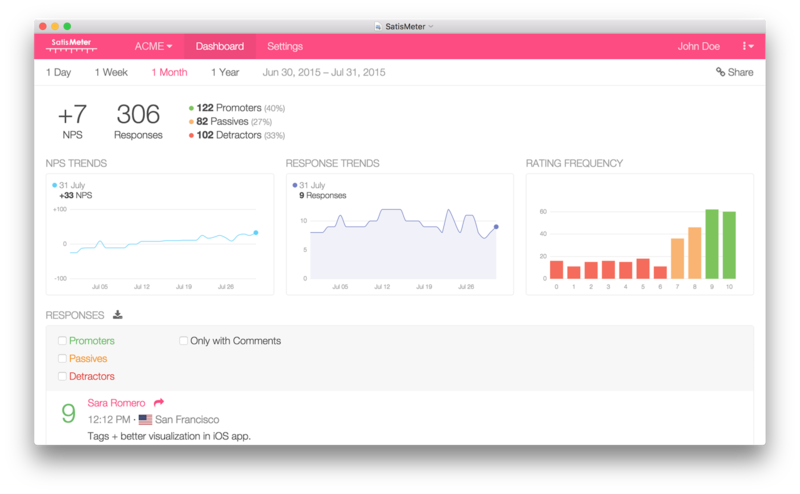 The SatisMeter app is easy to install into your web app with couple of clicks, just like any other Eager app. And if you’re curious how the SatisMeter widget will look on your website, you can preview it here.